Everyone always sais that after such a long flight you will have a horrible case of jet lag, that was my biggest concern, that once we had arrived, the first few days would be ruined, that we would waste our first days in this amazing city! But I couldnt help it, jet lag who? I was here, in Tokyo, and it seemed like I was waking up not on the other side of the world, but at home, where I belonged. There was no exhausted sensation, no I need more sleep, no feeling like I am in a haze or any other horrible thing I had heard happen to so many others, I popped awake at an obscenely early hour that first day, ready, ready for all the intense experiences and excited squeals (there would be many) that awaited me. What to do, that was a difficult question, what to do on our first day? With all that I wanted to accomplish while we were there picking what we did that first day was hard, I knew I didn’t want to rush, I knew that I wanted to take in every second of the day and leave nothing to waste and I knew this would happen. When we were planning/investigating for our trip I got this fantastic travel journal which I wanted to fill with all the amazing places and things I wanted us to do, and that was exactly what I did (I was still working on it on the flight over). My biggest thing though was that I didn’t want it to be an actual itinerary, I wanted to be able to wake up each day and open up the book and say, where do we want to go today? I also wanted it to be a living/ breathing entity that I updated as we lived through our adventure. So needless to say that first what do we want to do today was definitely a difficult question to answer! We decided that the best thing was to get a good look at the surroundings of where we would be living for almost 3 weeks. As I mentioned in my last post we had decided to stay in Odaiba (Tokyo Bay) which all through our trip and even as I write this now I truly believe was an absolutely fantastic decision! Odaiba is a group of artificial islands that actually date back to the time of the shogun and they sit in Tokyo Bay, the current structures that inhabit these islands are definitely very modern and are more catered to a tourist or business destination. There is so much to do there and definitely worth a day of adventuring. But lets be honest the reason that we decided to stay there is 60 feet tall and fabulous! 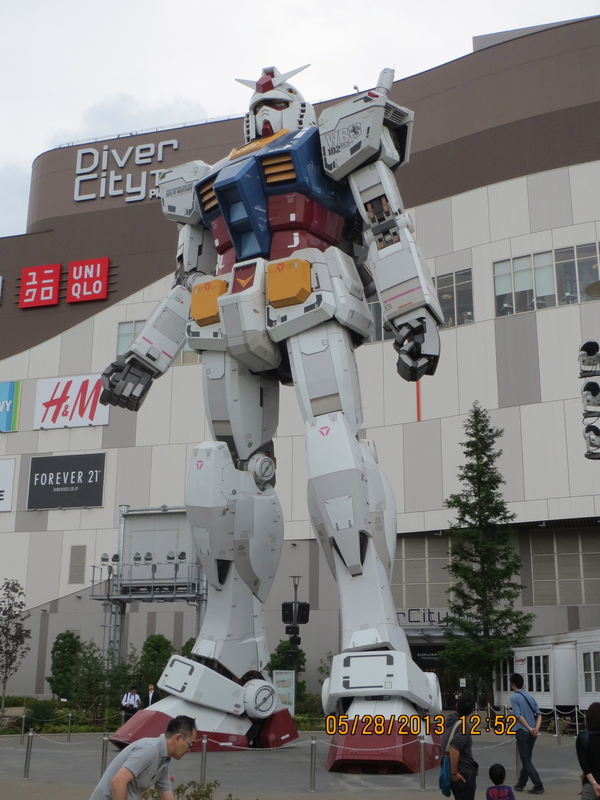 Im talking about the 1/1 scale model of RX-78-2 Gundam that was erected a little over a year ago at Diver City! Diver City is a huge shopping compound that was built around the same time they erected Gundam, it is five storeys of a huge variety of shops, western and not. For us though it was so all about Gundam, as it also houses one of only 2 Gundam Cafe’s in Tokyo as well as the Gundam Front and Gundam experience. For those of you that might not know what Gundam is (you definitely should though), Mobile Suit Gundam is an animated series that began in 1979 and has become a cultural phenomenon and has seen huge amounts of success and evolving into movies, figures, plastic model kits, and the collectors dream/nightmare! The day was slightly windy and overcast so we decided to walk to Diver City which was about a 30 min stroll from our hotel. As we stepped outside of our hotel one of the first sites that greeted us was what is known to most as “Tokyo Big Sight”, this mammoth compound is actually a convention center where all types of conferences and events are held and home to one of the biggest annual anime extravaganzas that Tokyo has, which we just missed of course. Being that Odaiba is a group of artificial islands all made very close together their are numerous bridges connecting them, the one we had to cross is called “Dream Bridge” and let me say that is exactly what it is! This bridge is a mammoth concrete and steel pedestrian only bridge with beautiful details, light, and framework all around. When we were planning our trip we used Google Earth to check out all the hotels we were considering and when we were investigating our chosen hotel we saw this amazing bridge that appeared that we would have to cross to make our way to Gundam, so you can imagine my squeal of delight as I walked up to the “Dream Bridge and saw that it was the exact same marvel that I had seen from space (it was especially beautiful at night)! You can honestly just spend a day walking around Odaiba and just enjoying your surroundings because as you go every section has its own theme and thus the landscape, structures and colors change to match, whether its Palette Town that is the home of Venus Fort (think The Venetian for anyone that has been to Vegas), or Aqua City that sits along the water and has a mini Statue of Liberty beside it as well as being the home of Sega Joypolis, or our most exciting destination of the day Diver City, everything around you changes as you go and the greenery was spectacular. All along our walk was a variety of gardens, fountains, and intricate benches where you can take a moment and stop to marvel at the scenery before you. That was, I have to say one of the things that struck me the most about Tokyo, no matter where we went, or how busy or congested that area was there was always nature sprouting out within the concrete jungle so that you can stop and remind yourself to enjoy life and unlike in America that was exactly what people were doing. From the salary man to the older or younger “Tokyoites” all seemed to find a moment in their day to enjoy the peace and beauty in their surroundings. As we neared Diver City there was a small ascension in our path and right at the crest of it I saw it, Gundam (for all the Gundam fans I think I will be doing a separate post because there was just so much that it deserves one all for itself). There were a few times on this adventure that I found myself getting choked up and having to force back the tears (the first was when our plane touched down at Haneda airport) and it was happening again. You have to understand we are huge Gundam fans and have spent many an hour building our Gunpla (plastic model kits) and watched every moment as they erected this life size amazingness so to be standing in front of it and staring up with my mouth wide open (Im sure I looked hilarious), the fact that I was there, in person, and if it wasn’t for the fact that he was roped off I could actually touch him was almost a liitle to much for this “otaku” to handle. This trip would be full of several moments like this for me and just simply recounting this now makes me sigh with how much I miss Tokyo! Once I was able to focus on anything else I squealed with delight to see the Gundam Cafe was just about 50 feet away so as I started walking towards it to get what would be the first of many “Haro Latte’s” (I am obsessed with Haro) I realized that right out front of the cafe was a row of Gashapon (small vending machines of goodness/evil), nothing that you have ever experienced before will prepare you for these amazing little devils and if you are anything like me will soon discover that you need to have a completely seperate fund set aside for this little addiction and addicted we became having to stop and check out every row and end up with a small tote bag full of them by the end of our adventures! So here, on my first day in Tokyo I enjoyed a “Haro Latte”, my first Gashapon (who is still my fav. ), and the sight of Gundam RX-78-2, and it was amazing!